Summary: The enchanting story of a midwestern girl who escapes a family tragedy and is remade as a movie star during Hollywood’s golden age. Prior to leaving for this year's BEA, there was a list of books that I had to read just in case I was lucky enough to have the opportunity to meet one of the authors. 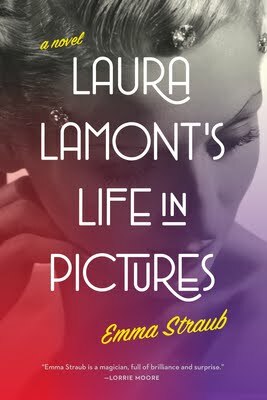 One of those books that was at the top of my list was LAURA LAMONT'S LIFE IN PICTURES by Emma Straub. Fortunately, I was able to finish it just a few days before I left for New York, and it was a good thing because who did I happen to meet on the floor of BEA (not once but twice!) and then again at the Penguin Bash? It was none other than the very talented Ms. Straub! I was so glad that I was able to tell her how wonderful her novel was and I'm sure I embarrassed myself with all of my over-the-top praise. So that should probably be a heads up that I'm going to rave about LAURA LAMONT'S LIFE IN PICTURES for this entire review. But just in case you don't believe me, I should mention that Entertainment Weekly magazine (also known as my go-to place for book recommendations) gave this novel an A- just last week; and they even included it on their Must List. That's pretty impressive! LAURA LAMONT'S LIFE IN PICTURES tells the story of Elsa, a young Midwestern girl who loves performing in her family's playhouse in the 1920s and 1930s. When something horrible happens to a family member, Elsa's innocence is lost and her love of the theater takes on an entirely new meaning. As a teen, she marries a young actor and moves with her new husband to Hollywood. There, Elsa's life and career opens up when she is discovered by Irving Green, an extremely powerful Hollywood executive. Irving sees Elsa's potential and decides to "make" her into a glamorous movie star -- he has her hair cut and died dark brown and even changes her name to Laura Lamont. Laura has much success as a Hollywood actress even winning an Academy Award, but she quickly learns that her fame isn't without a price. Laura is forced to evaluate her relationships, her career, her family and even her own self as she attempts to discover what is truly important in her life. I loved LAURA LAMONT'S LIFE IN PICTURES and it was definitely one of my favorite books of the summer. It's a beautifully written novel that delves into the complexity of Elsa/Laura's character, but at the same time does a wonderful job of showing the glamorous side (and the not-so-glamorous) side of the golden age of Hollywood. However, what I appreciated the most about this story is that how it resonated with me. Despite seemingly having nothing in common with Laura, I loved her and felt her pain; and many of her issues were ones that are universal to me and women everywhere -- how to balance family, friendship, marriage, and career while also staying true to one's self. I could go on and on about so many great things in this novel, but one thing that definitely stood out to me was how well Ms. Straub brought to life the golden age of Hollywood. I admit that I've always been interested in famous people and the gossip of their lives (I know, I know...), and I love seeing old pictures that feature the beautiful movie stars. Ms. Straub managed to make this time period so incredibly real to me and I could picture so many of the scenes in this novel perfectly. (By the way, this story would make a perfect movie!) Furthermore, she did an outstanding job of showing both the glamorous side of the studios along with the effects it had on the actors and actresses who were basically "owned" by the studios. In addition, Ms. Straub's prose and character development were really special. She has major writing skills, let me tell you! I know the author has written a lot of non-fiction articles and stories; however, it is absolutely amazing to me that this is her first novel because it is so polished. There were many times that I stopped to read a paragraph or two again because she said things that were so true about human nature or because she described a scene so perfectly. However, the real beauty in her writing was in how well she developed the character of Laura -- from the time when she was a young innocent Elsa, to her transformation into Laura, to her rise as a movie star, and finally to the decline in her career. It was an amazing look at one woman's life and all of the ups and downs she experienced which made her into who she was. I didn't exactly expect to have this novel resonate with me like it did. I am a stay-at-home mom who lives in Central Pennsylvania and has been married to the same man for nineteen years. I couldn't have less in common with Laura's character, yet I still felt as if I understood her. Of course, much of that is due to Ms. Straub's writing and character development, but I appreciated that she made sure that Laura was a character that all types of women could relate to. Laura had many of the same issues that today's women face like the balance between career and family, marriage troubles, and the challenge to stay true to one's self. And it was because of the realness of Laura's struggles that made her character, and ultimately this novel, so special to me. It should come as no surprise to you that I highly recommend LAURA LAMONT'S LIFE IN PICTURES for your next book club pick. I truly believe book clubs consisting of women will adore this novel and find much to discuss. There is a reading guide with seven interesting discussion questions; however, I think they only begin to touch upon the many themes that exist in this novel. Laura is a fascinating character and there is a lot of room for assessing her actions and motivations. Some of the other topics you might want to explore include the studio system era in Hollywood and how it changed through the years as well as the sacrifices actors and actresses make to be famous. In addition, you could discuss the themes of love, marriage, parenting, ambition, success, fame, and happiness. LAURA LAMONT'S LIFE IN PICTURE is a wonderful fiction debut by an extremely gifted writer. As far as I'm concerned, it's a must-read book! Thanks to the publisher for a review copy of this novel. I'm fascinated with that time period of Hollywood as well. This book sounds fabulous!! This sounds like an awesome book. Thanks for the review. Great review. Sounds liked a terrific book. Whoa ... you've grabbed me by the collar. This is going on my list immediately! You make this sound really good although ordinarily I could care less about Hollywood books! I have this on the top of my pile for this month. I can't wait to get to it.